Since its announcement in 2015, fans have eagerly been awaiting the remake of one of the most loved entries in the Resident Evil series, Resident Evil 2. The series has seen shifts in its gameplay over the years, from tank controls, to an over the shoulder view, to Resident Evil 7 making the move to first person with PlayStation VR support. Fans have been wondering just what Capcom would decide to do with this remake, how it would play, and what (if any) changes there would be to the story. We don’t have to wonder anymore, with the remake of Resident Evil 2 having launched last week on January 25th for the PlayStation 4, Xbox One and PC to praise and…well, let’s just say the internet loves Mr. X. Rookie cop Leon Kennedy and college student Claire Redfield find themselves in the middle of a zombie outbreak during a visit to Raccoon City. From the very start of the game, we can see that things are very close to the original 1998 release, but are shifted around enough to make it interesting. Instead of the truck driver finding his way to the gas station where he gets bit, and inevitably causes our heroes to split apart at the original game’s start, it’s Leon and Claire that have a brief encounter with the undead during a pit stop on the outskirts of town. The gas station serves as a tutorial of sorts, letting players get their feet wet before being thrown head first into an infested city of nightmares. Once arriving in Raccoon City, they make their way to the police station where they run into a small cast of characters and start to piece together the cause of this outbreak as they try to make their escape. Both Leon and Claire have their own story, and the canonical “Claire A/Leon B” play order of the original isn’t here. Each character will see the story play out the same, regardless of if played first, or during what the game calls “2nd Run.” More on that in a bit. 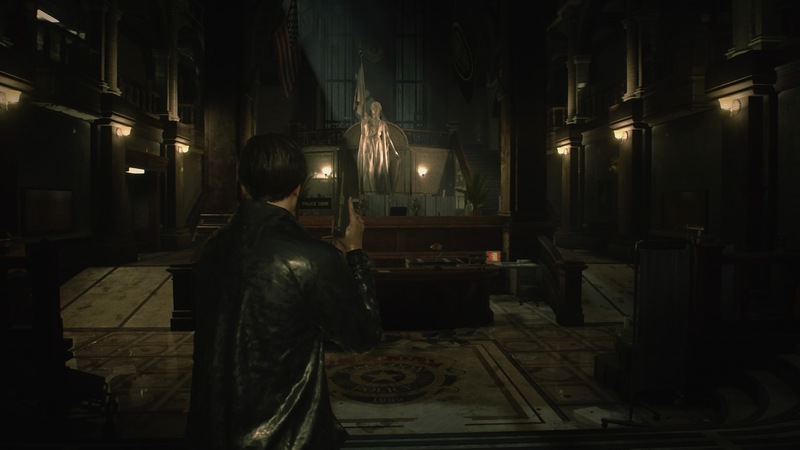 For the remake of Resident Evil 2, the developers have decided to go with a third person camera, forgoing the original’s tank controls, and passing on the first person view used in Resident Evil 7. The camera works well, giving you a nice range of view of the enemies that might be lurking in the shadows in front of you. However, that doesn’t mean that you’ll always see your enemy coming. This game constantly kept me on my toes. Even throughout my multiple playthroughs, when I had thought I had learned the enemy placements, or memorized the jump scares, this game always found a way to throw a wrench in my stress levels. The first thing that players will notice when they embark on their night of survival is that zombies don’t go down as easily as you might hope. Several gunshots to the face might make a foe drop to the ground for a time, but unless you’re able to score a critical head-bursting shot on them, there’s a very real chance they can, and will get back up at some point. The hideous Lickers also make their return, more vicious than ever as they run on the ground, the wall, and the ceiling in their pursuit of you, making them harder to hit than ever before. Lickers are blind and rely on sound to find their next victim so there’s a possibility that if you walk slowly down a corridor where you see one dangling on the ceiling, you might be able to just go right past it…if you’re lucky. 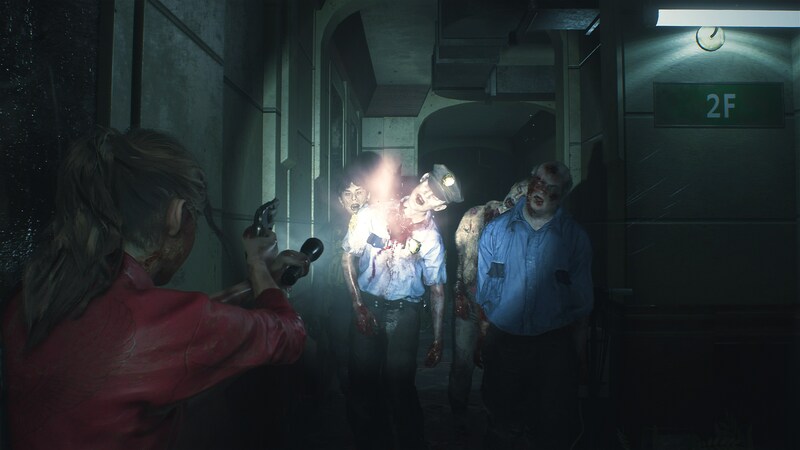 Ammo conservation is incredibly important in Resident Evil 2, and this is made even more challenging with the enemies’ ability to take more shots than ever. Naturally, I was inclined to try and dodge a lot of them during my playthroughs…what a foolish idea. The zombies can lunge, and will do so quite often, making it incredibly difficult to simply walk around them. If there’s an enemy in your path, you will need to use some of your precious ammo to stun them long enough to run past, or if you’re lucky enough, completely incapacitate them. Luckily, when you inevitably do get grabbed by an enemy, the game has taken the concept of the original Resident Evil‘s remake and included defensive weapons. A knife, grenade, or flash grenade can be equipped after finding them, allowing you to freely use the item, or in the case of being grabbed, quickly use it against your attacker in order to get away free of harm. In the case of the knife, you can even reclaim the item if you can drop the enemy you used it on, providing that its durability hasn’t rendered it useless. It’s a welcome addition, especially when considering how difficult it can be to avoid enemies. Be quiet so the Licker doesn’t hear yo— crap. Another change apart from the original is the way that loading between rooms works – there isn’t any. You can’t simply hit a button in front of a door and be whisked away from your attacker via a loading screen. If you run past a zombie in the hallway on your way into another room, there’s a fair chance you might hear some pounding on the door after you go through it. I did find, however, that there are some areas, such as the east wing of the RCPD on the first floor or the library, where it seems zombies just don’t want to follow you out the door. What will follow you out the door, however, is the latest internet sensation, the ever-dapper Mr. X. His arrival is slightly different this time around, but his presence is much more terrifying. Once he arrives, Mr. X will patrol the entire RCPD looking for his new best friend, you. The first time I encountered him sent my blood pressure skyrocketing as I ran from him, trying to figure out where I could go that would be safe. And yes, while there are some rooms that seem to be safe from the stalking Tyrant, you’ll find that he can freely chase you around the entirety of the station if you’re unable to shake him. During the parts of the games where Mr. X was present, I was so terrified of shooting a zombie to make my way to my next destination, in some cases, I was even afraid to run, wanting to make as little noise as possible. The worst part about all of this is you can hear him coming. His loud, thudding footsteps can be heard from rooms away as they’re accompanied by doors opening and closing. Even worse is when you’re trying to accomplish specific goals to help get you to the next area. You might go into the Library, looking to move some bookshelves when suddenly you can hear the loud, distinctive sound of his footsteps approaching. Do you hide? Do you just start running now and hope to get a decent lead on him? There is no correct answer. I found myself often rushing from room to room trying to collect the items in them as quickly as I could while being pursued by Mr. X. It’s been one of the most terrifying things I’ve ever dealt with in a game. Lastly, after you complete the game once, you’re granted access to the “2nd Run” playthrough. As mentioned before, there’s not really an A and B scenario in this game. The story stays the same regardless of when you play as Leon or Claire. What will change during a 2nd Run game is where your character starts out, and the gun and ammo you have access too. 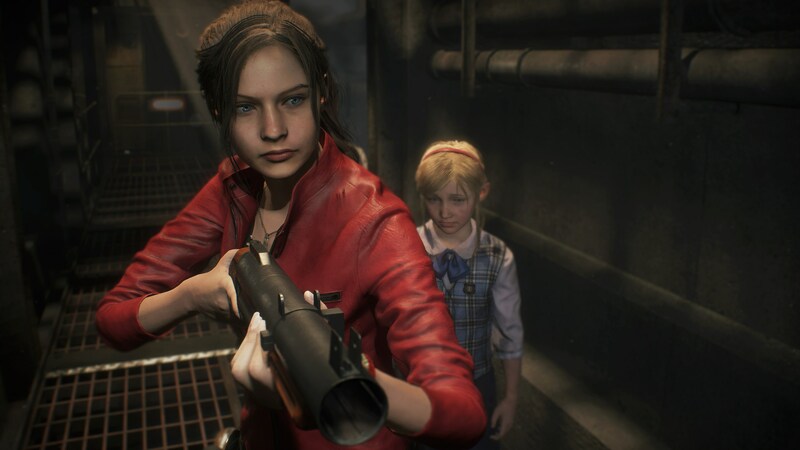 Having played as Claire my first time through, I loaded up Leon’s 2nd Run and found the weapon switching to be a little difficult. Each character’s handgun gets some great upgrades as you proceed through the game, but when beginning a 2nd Run, you’re given a different gun almost immediately, and that’s the weapon that you’ll find bullets for – not your main, upgradable weapon. You can use the gunpowder you find in the game to make bullets for your original weapon still, but it definitely makes the already hard game of ammo conversation a little trickier when you have two hand guns, and two types of hand gun ammo. If you’re still reading this, then it’s no surprise that it’s hard to talk about this game without talking about the original 1998 release. As a fan of the original, it’s incredible to see how Capcom has taken the areas of the original and made them new, while also keeping so much of the original there. I found myself constantly recognizing areas as I made my way through the game, only to then be greeted by a new room, or even a new area that wasn’t in the original. It’s a fantastic blend of the old and new. The RCPD finally has bathrooms now too! The same iconic jump scares from the original are also moved around slightly. Walking down a certain hallway for the first time will have fans of the original thinking “It’s about time to see that enemy,” only to have it be nowhere in sight. During that “2nd Run” however… after the game has tricked you into thinking those scares aren’t there, they return, exactly how you remember them. This game knows its roots, and it celebrates them beautifully. 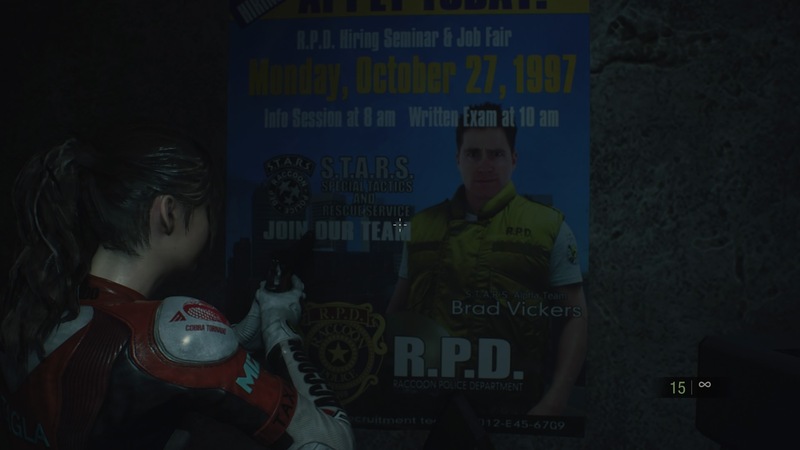 While not around in the remake to provide players with alternate costumes, the developers left a loving nod to everyone’s favorite yellow-vest-wearing S.T.A.R.S. member. The story, while the same as the original, does expand on the dialogue within it, adding new layers to some of the characters that we simply didn’t see before. The voice acting in Resident Evil 2 left me surprised at just how good it was. Everything, from the creaking of the floors to the dark hallways where enemies can lurk from the shadows, is perfectly crafted to keep you tense and filled with a sense of dread as you explore the various areas of this game. 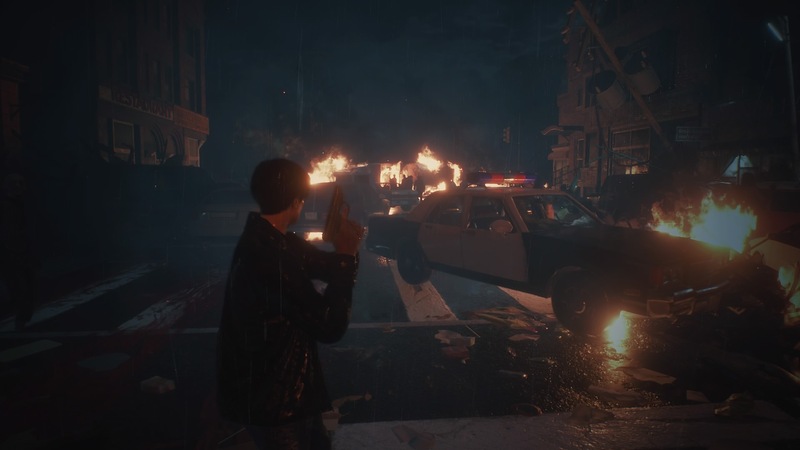 This remake of Resident Evil 2 takes what we remember of the original and reconstructs it from the ground up with more scares than ever before, letting players experience the Raccoon City Police Department and its connecting areas in a way they never have. 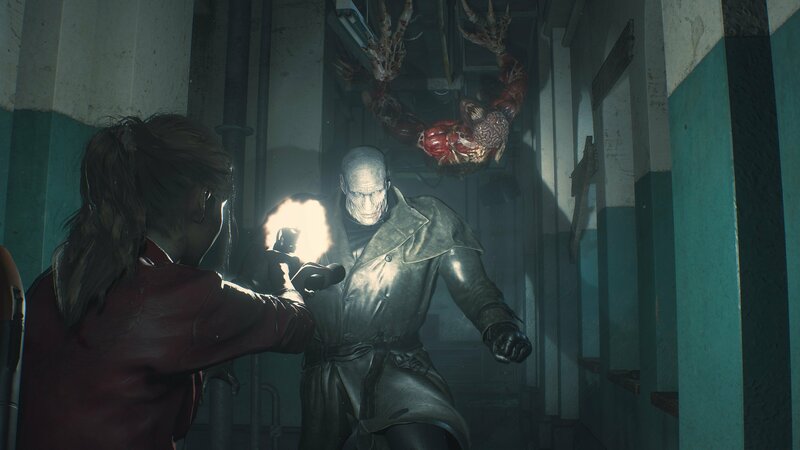 The enemies can be resilient, and Mr. X can sense the absolute worst time to show up, making you have to completely change how you were going to get to your next destination as he quickly walks behind you in the hopes of being able to wind his arm back and punch you in the head. 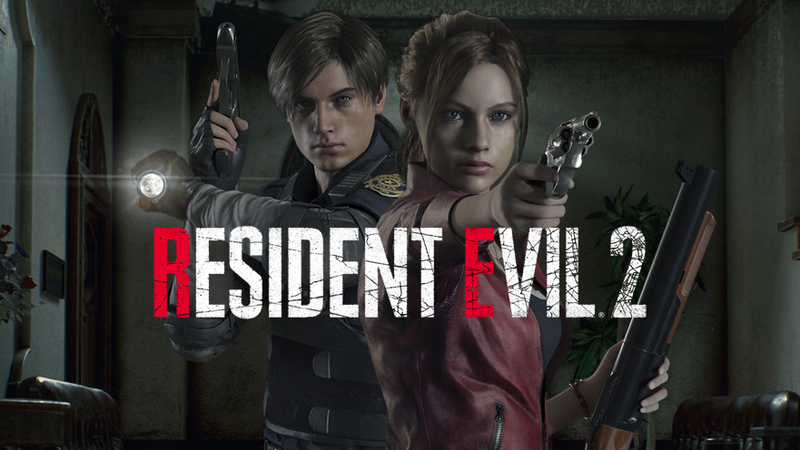 With first- and second-run scenarios, the extra 4th Survivor mode, and plenty of records to complete in order to collect unlockables like extra costumes and weapons with infinite ammo, Resident Evil 2 has plenty to keep you busy, even after your initial playthrough. Review copy provided by Capcom for PlayStation 4. Screenshots provided by Publisher and taken by reviewer.